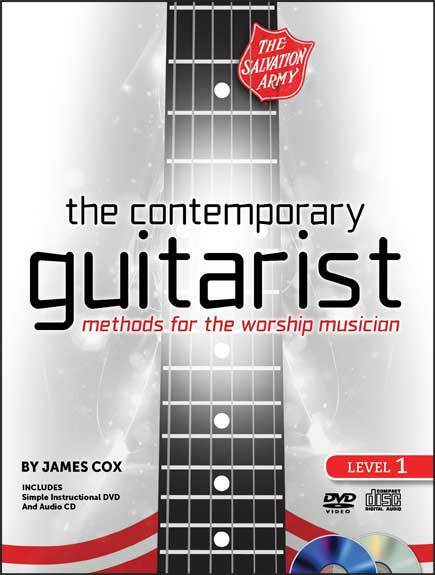 The Contemporary Guitarist: Methods for the Worship Musician by Jimmy Cox is a complete guitar method series for those who wish to become quality worship musicians! This course is for anyone, even if you've never touched a guitar before. The included CD contains all songs and exercises, and the accompanying DVD is like having your very own instructor for every lesson! Includes how to play all common open chords, complete with diagrams, photos, and exercises; songs by transMission, one of the Salvation Army's premier praise bands, as well as other classic hymns; suggestions for other popular songs that can be played at different points in the book and QR code links to extra online content. Includes how to play chord alterations, sharp and flat notes, barre chords, and how to use a capo; more songs by transMission; more suggestions for other popular songs, and QR code links to extra online content. Includes fingerstyle playing, reading tablature, and more time signatures. You will also learn more ways to use a capo and playing in alternate tunings. This edition also has more songs by transMission, suggestions for other songs, and QR code links to extra online content.